Cressfield Stud has a long and deservedly well established reputation as a vendor of superior pedigrees, and this has translated into top racehorses and sire prospects. Recently, in 2014, Cressfield sold Headwater (Exceed and Excel – River Dove, by Hurricane Sky) for $500,000. He won the Gr.2 Silver Slipper Stakes as a two year-old, and raced on at three, to compete only in stakes company and win a Listed event. Now retired to Vinery where he commenced stud duties in 2016. Previously, Cressfield sold the gorgeously bred Onemorenomore (Red Ransom – Palia, by Last Tycoon), who lived up to his pedigree by winning the Gr.1 Champagne Stakes. He is starting to emerge as a solid stallion with recent Gr.2 winner One More Honey, and several other stakes horses. The 2018 Inglis Easter Cressfield Stud draft is bound to include several exciting stallion prospects. Bluebloods spoke to Operations Manager Liesl Baumann. Stallion prospects all start with fabulous broodmares. 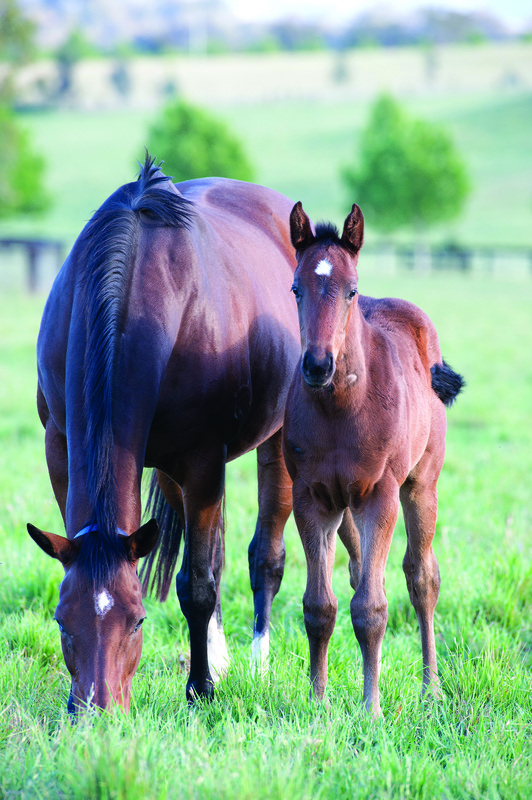 Can you name some of the best mares on your farm? It’s probably fair to say that we have one of the most enviable broodmare bands in the industry and it’s such a pleasure to work with such high-quality stock. Three mares who’ve been here since I started at Cressfield nearly 12 years ago, and who are now in their late teens and early twenties, are River Dove, Regimental Gal, and Our Egyptian Raine. They are all Gr.1 winners who have gone on to produce group winners themselves. Star Satire and Miss Judgment, two more elderly ladies came along a few years later, and both have been fabulous producers for Cressfield over the years. More recent acquisitions include Listen Here, a $3.4m mare bought in partnership with China Horse Club whose first two foals were Deep Field and Shooting to Win; Mid Summer Music, a Gr.1 Stradbroke winner of over $1.3m; Platelet, a dual Gr.1 winner; Real Surreal, winner of the Magic Millions Two Year-Old Classic; Gr.2 winners Thump and Wild Rain, and our homebred and raced Gr.3 winning daughter of Regimental Gal, Lilliburlero. Updating your breeding stock is of course a key strategy to remaining commercial, but we also have some lovely paddocks dedicated to our darling retirees to live out their twilight years in comfort. Champagne and Snowdrift are recent retirees who still happily saunter over to their feed bins for their daily breakfast. Ironically, our biggest racing highlight this year came from a homebred horse that was never offered for sale. Clearly Innocent was essentially too ugly, too gangly, with too many x-ray issues to warrant entering him for sale. Time and patience unbelievably saw him win the Gr.1 Darley Kinsgford-Smith in the winter and then get the chance to run in the inaugural running of The Everest. While he didn’t win, he was by no means disgraced and the fact that our ugly duckling was mixing it with the very best and beat many of them home was really an uplifting experience. It is horses like Clearly Innocent who do their bit to level the playing field. If all the best pedigreed, best conformed horses won all the best races, racing wouldn’t hold half the appeal it does. Let’s take a look at the draft as individuals, with comments by Liesl. Cressfield have reserved our very best horses for this sale so collectively they are an extremely nice bunch of horses with perennial pedigrees, making it hard to pick a standout from the draft. From the farm which specialises in stallion prospects comes Lot 208. A colt by Medaglia d’Oro from Listen Here, he is a half-brother to freshman sires Deep Field and Shooting to Win. Cressfield will present three fillies by Champion Sire Fastnet Rock who needs no introduction, highlighted by a full sister to Gr.1 placed Gr.3 winner Missrock. Lot 238 is out of Gr.3 winner Miss Judgement, a half-sister to three other stakes winners including Gr.1 winner Mrs Onassis. “She has thrived during her preparation, relishing exercise, and is a strong, developing filly with a great temperament.” Fastnet Rock filly, Lot 178, is out of Gr.2 winner Jeu de Cartes, whose first foal, Flora de Mariposa, sold for $700,000 and is a winner over a mile in Japan. “She is a short coupled, muscular filly with sound bone and feet, and a huge nostril.” The other Fastnet Rock filly is Lot 229, out of Gr.1 winner Mid Summer Music whose first foal, See It Thru, won on debut recently. A potential sire prospect, if one can overlook a superficial blemish, is Lot 380 by Champion Sire Snitzel from Gr.1 winner Star Satire. This colt is a half-brother to Gr.2 winners Satin Shoes (dam of Satin Slipper) and Zarzuela (dam of Serious Satire). I Am Invincible’s progeny have been selling well, and Lot 206 is the first foal of Gr.3 winner Lilliburlero (a daughter of Gr.1 winner Regimental Gal). “She is a forward filly with an elegant length of rein, attractive head, and lovely nature.” Another first foal is Lot 402, by Exceed and Excel, this colt is out of Gr.2 winner Thump.